A revised set of 52 colorful storybooks designed for children ages 2-3. A meaningful way to nurture faith at home and at church! Order one per family or one per classroom. Free program guide and patterns (PDFs) are available, below, under Other Resources. For the past 16 years, God Loves Me storybooks have been a well-loved and much-used resource in church preschool ministry. Newly revised in 2015, these storybooks will provide families and churches with a wonderful way to nurture faith while establishing devotional habits of Bible reading and prayer. 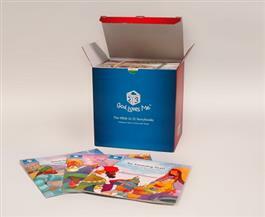 The free program guide (below) gives specific suggestions and resources to help you use the God Loves Me program with the little ones at church and preschool or with your own child at home.